Today Apple is on fire and firing out the Software’s for iDevices and MAC. Apple released iOS 5, iWork,OS X Lion 10.7.2 and much more. After they released everything, now they released iTunes Movie Trailers’ App for iOS in iTunes. This universal App for iPad, iPod and iPhone offers easy access to iTunes Movie Libraries. The App is also integrated with iCloud and includes many other features. Access hundreds of movie trailers, clips, behind-the-scenes featurettes, and images, available in HD or SD. – Explore an interactive, year-long release calendar that helps you plan when you’ll be going to the theaters. – Save favorite movies and theaters for immediate access anytime. – Search what’s playing at your local theaters and purchase tickets directly from your iPad or iPhone. – Save images to your iPad photo gallery, to use as iPad or desktop wallpapers or send to your friends. 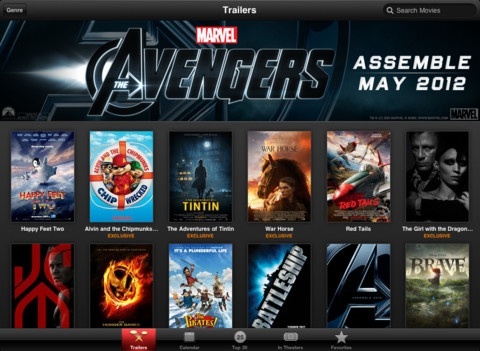 – Browse top charts to view the most downloaded trailers, box office rankings, and top movies on iTunes to buy or rent. – Use iCloud to push your favorite theaters and movie trailers to all of your iOS devices. iTunes Movie Trailers is free on iTunes. You can download the App from here.